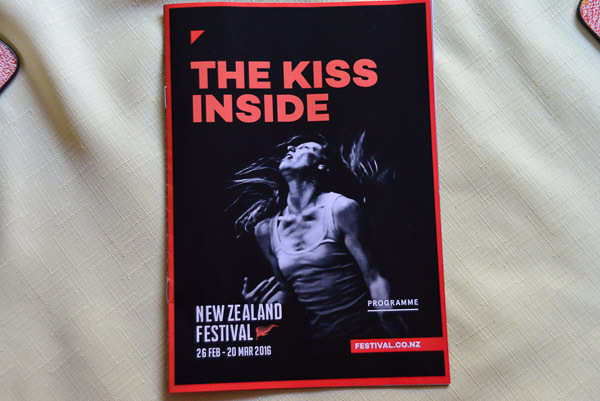 When Tara told us that she was booked for two shows in Wellington as part to the Festival of NZ, and that Pippa would be there too, what could we say but “Can we come?”. 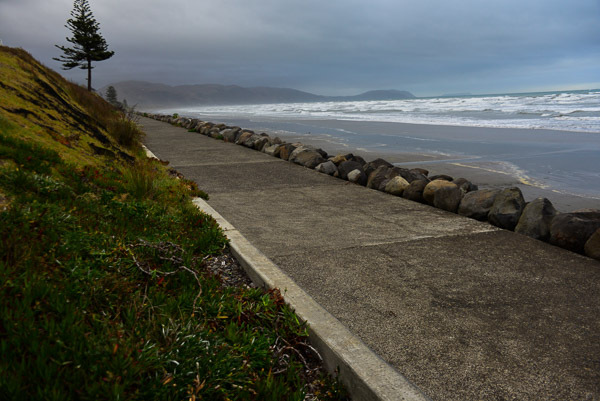 And so here we are in Kapiti, some 50km north of Wellington staying in a lovely house just five minutes walk to the ocean on the west coast of the North Island. We have been lucky enough to arrange a house swap with Rob and Eileen (thanks you two) which has allowed us to be near the city without actually having to be in the middle of things. 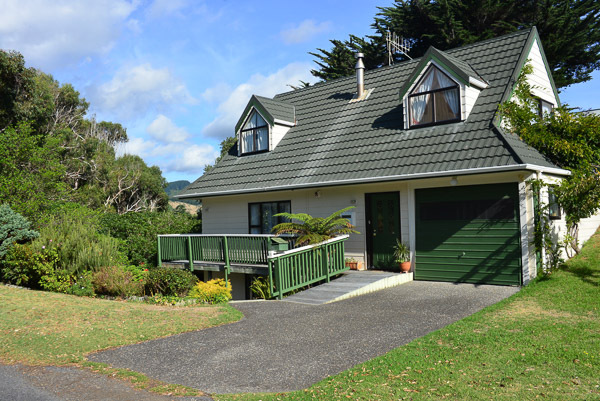 Our house swap in Kapiti … just the thing for aspiring hobbits! One of Pippa’s photographs on the cover of the program. 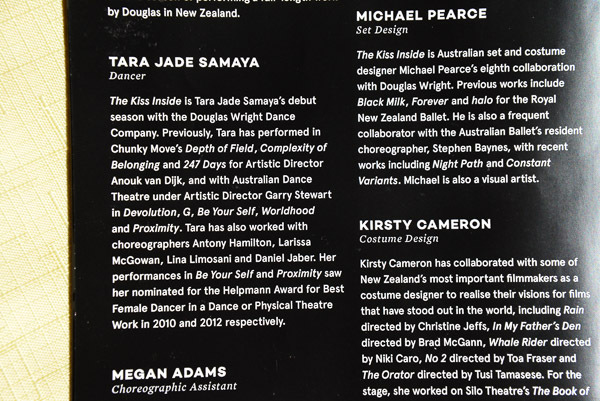 This about Tara in the program. The beach here is soooo different to the beaches we are used to in Queensland. The west coast and black sand stretching off into the distance are such a contrast. 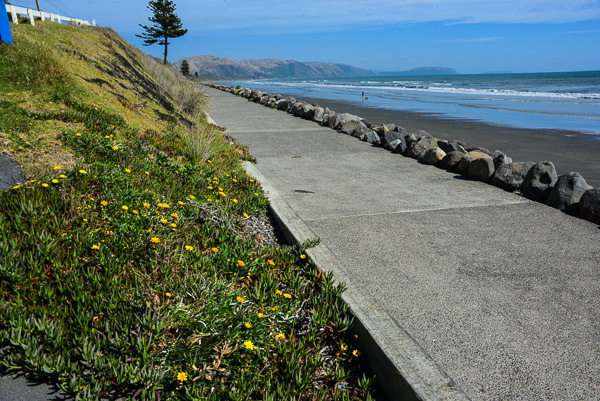 Raumati South Beach just a short walk away. And then there’s the weather … you know, four seasons in a day and all that. The weather forecast is given in layers here. The idyllic scene above can easily give way to the three layer day with 100k/h winds as shown below. 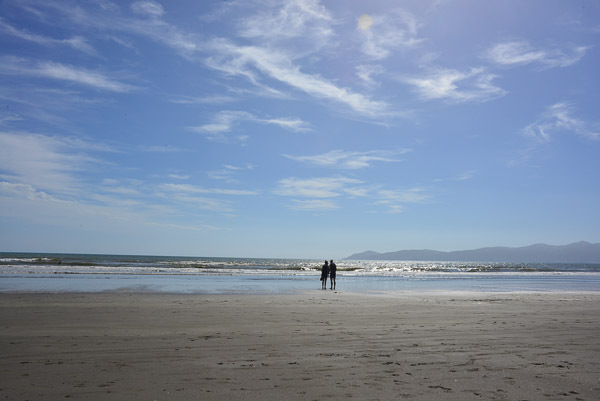 Raumati South beach on a three layer day! Pippa and Tara enjoy a rest day …. not quite sure why they didn’t swim though. Now I have a little quiz for you all! Geography 101: Q1. 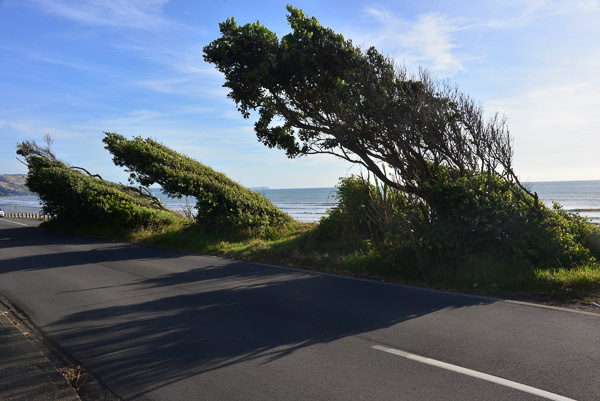 On the west coast of New Zealand from which direction does the prevailing wind blow? Got it … Got it? Geography 101: Q2. 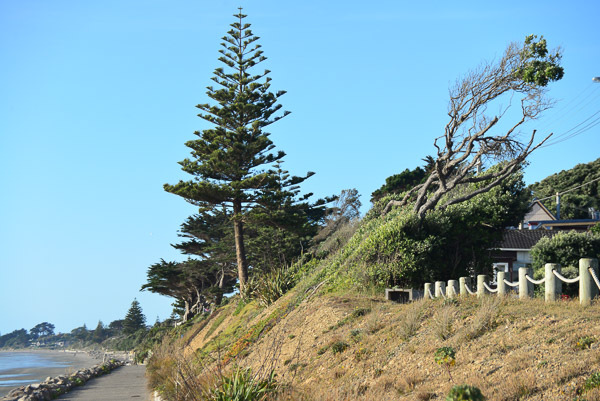 Are Norfolk pines affected by the prevailing wind? Got that one too? 🙂 Why not, I ask myself. Seriously though … it is a pretty spectacular beach but it does need some pretty serious defences against the ever rising sea level. The logs in this pic are very big and have simply been tossed up at high tide. Some serious sea defence needed here. 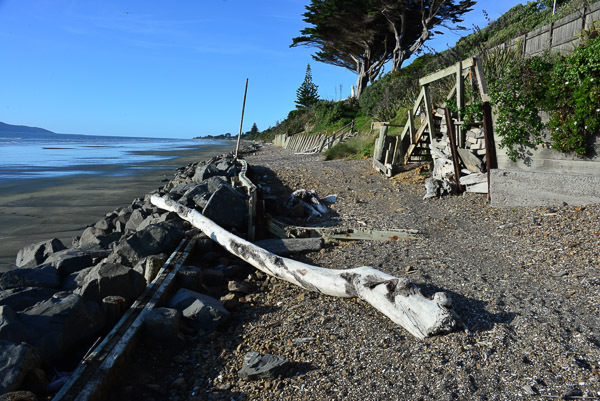 There are houses all along this beach … it must be a popular commuter spot for those who work in Wellington. 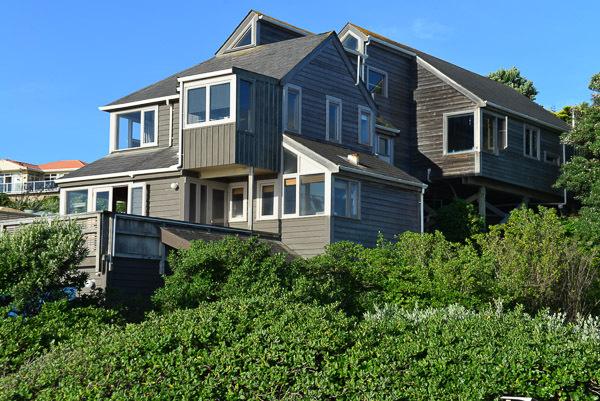 The house that Jack Built … and changed the design a number of time along the way it seems! We take a day to check out the country to the east and try and get into the hills that run down the middle of the North Island like a spine. Up a very wiggley road and we can look back down to the coast. 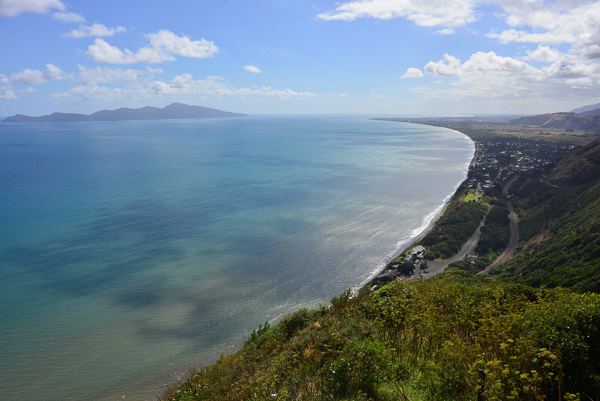 The view back to the coast and the island of Kapiti. 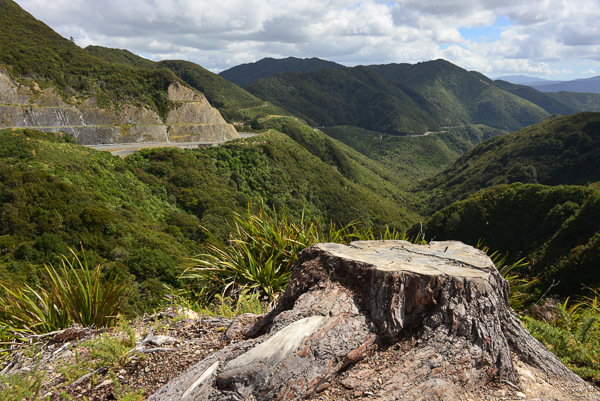 Then off through the Hutt valley; Lower Hutt and then Upper Hutt and then up to the Rumutaka Crossing. We take these passes so much for granted these days, whizzing up them on smooth roads, but back during WW1, thousands of soldiers route marched across this pass. 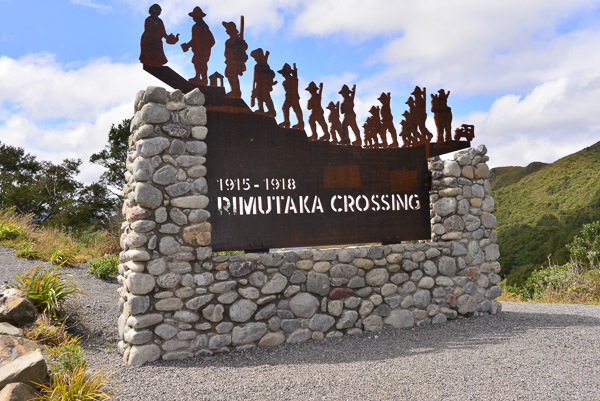 Rumutaka Crossing on the way to Featherston. Much used in the first world war. Rumutaka Crossing back down the valley to the Hutt River. Quite a feat of engineering! Tonight we go to Tara’s second show, “The Complexity of Belonging”. It will be the first night of a five show run during the festival. This show has already run in Melbourne and has toured through Europe last year. You can catch a glimpse here. Really looking forward to it … don’t go to first nights very often … might even have to dress up! 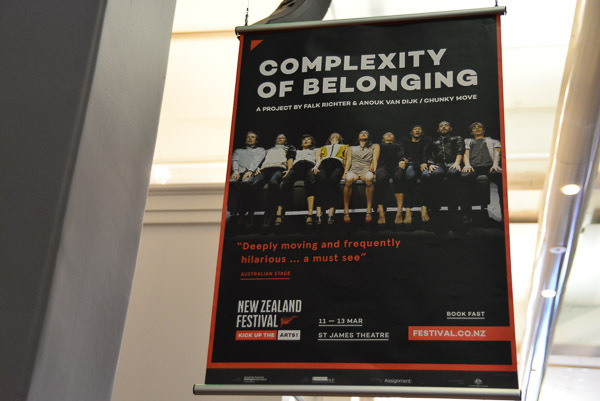 ‘Complexity of belonging’ at the James Theatre in Wellington. 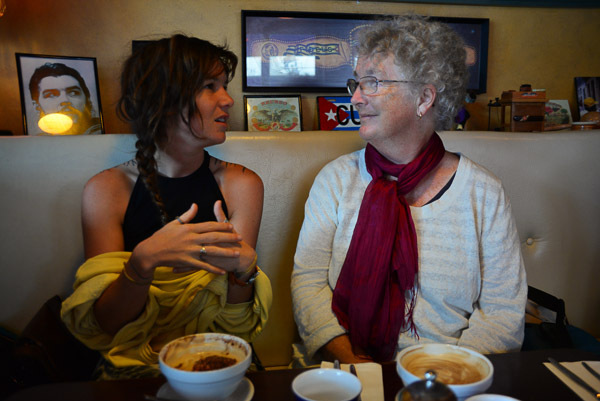 Mother and Daughter with lots to talk about. Sitting on the deck of this lovely house, we can’t see the sea … instead we have to look at flowers. Doh! 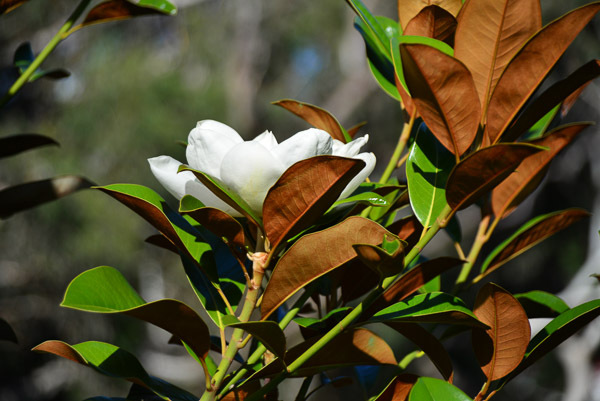 Magnolia … don’t you just love trees that flower! Great photos of windy Wellington! Thanks for sharing. Looks like Tara is a very accomplish dancer. The title of the show ‘The complexity of Belonging’ sounds so interesting. It makes me want to see it. Oh what joy! Dance, family, landscape! Life is rich! Hi Alan, amazing photos as ever. I will have to show my business partner, Skippy, as he is from that neck of the woods. Dear Alan and Jacquie, we have never met you but feel we would enjoy your company. We are glad you have enjoyed our home as we have enjoyed yours. Certainly contrasting life styles! I have been looking at your blog and was amused by your experiences which seem to mirror our own! Cruises, gps errors that took us into formidable territory in France and Spain! Not funny at the time but very funny when you look back? Thank you for exchanging with us.